Please call 01992 578496 for colour and size availability. Air cushioned head collar padded on nose and poll for comfort with brass fittings. Available in Flo pink and Flo orange. 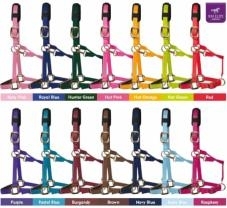 Also available in bright yellow, hunter green, navy blue, violet, baby pink, black and brown. Sizes available colt, pony, cob, full.